The salads are a very cool thing, but you have to know how to cook them. 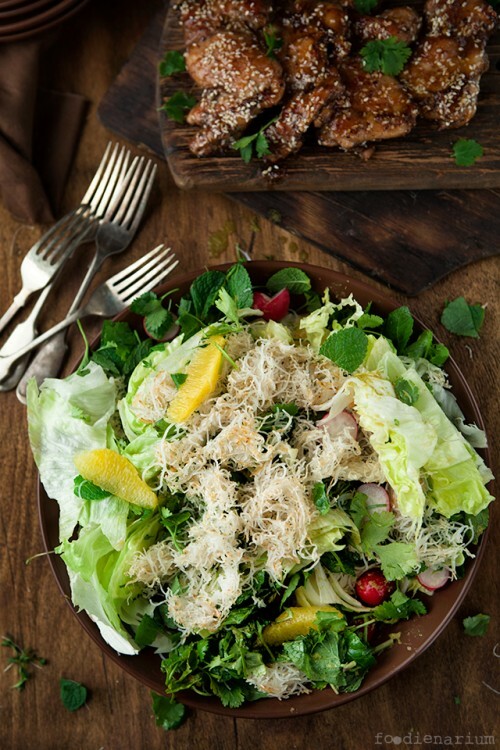 You should be able to choose ingredients well, so that the tastes combined well, the salad looked beautiful and the salads varied. My wife and I do not always succeed, because of banal laziness mostly, but we periodically try to correct. It is one of such cases. If you cook it in the summer, you can use watermelons, but when they are not on sale, oranges are a good choice. In a bowl, fully submerge the noodles in boiling water. After several minutes drain the noodles and toss with 1 tablespoon of sesame oil on a big serving platter. Put 1/2 of the noodles into the medium frying pan, tossing regularly until nice and crunchy. Remove skin from oranges, and them into chunks and add to the platter. Trim the lettuces and cut into small wedges, halve the radishes, finely slice the top leafy half of the mint and most of the top leafy half of the coriander, and scatter over the platter. Put the coriander stalks into the liquidizer with the soy sauce, chilli, pilled ginger, trimmed spring onions, a splash of water, 1 tablespoon of sesame oil and the lime juice. Squash in the unpeeled garlic through a garlic crusher, then whiz until smooth. Pour the dressing over the salad and toss gently until well coated, then break over the crispy noodles.